Drag Race series Rear Lower Control Arms, for 1979-98 Mustang, with adjustable-height spring perch and spherical bearings. When your Mustang has Big Power (in the neighborhood of 600 to 1,000 ft-lb of torque at the rear wheels) you need rear lower control arms that are a step above the rest. 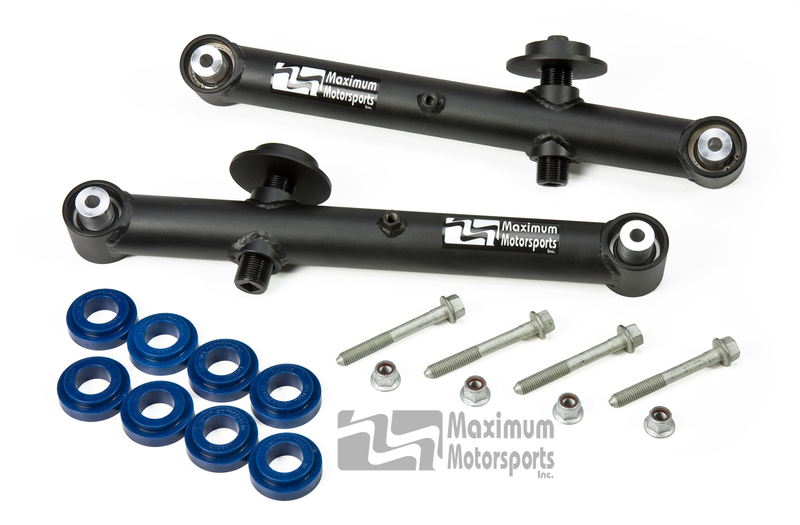 Maximum Motorsports Drag Race series control arms provide the ride height adjustability essential to tuning for the optimum launch, along with the robustness required for hard launches at the strip with Big Power on slicks. These Drag race control arms are intended for Mustang's with a power level exceeding the 600rwhp rating of MM's curved adjustable control arms. The straight tube of these control arms was designed for launching a 3,800 lb Mustang cutting a 60-foot time as quick as 1.20 seconds. That rating is for a standard 4-link suspension. If you Mustang is equipped with a torque-arm, the loads on the rear lower control arms are much lower, and therefore he MM Drag Race control arms can handle even more than 1,000 t-lb of torque at the rear wheels. When adjusted to the lowest ride height possible, your Mustang will be approximately 0.5" higher than it would be with a stock-style control arm and the same spring, due to the height adjuster mechanism. This dimension is with both spring isolators in place. Remove the lower spring isolator, and when adjusted to the lowest ride height possible, your Mustang will be approximately 0.4" higher than it would be with a stock-style control arm and the same spring. Remove both the lower and upper spring isolators, and when adjusted to the lowest ride height possible, your Mustang will be approximately the same ride height as it would be with a stock-style control arm installed with the same spring and both spring isolators. When adjusted to the highest ride height possible, your Mustang will be approximately 3.5" higher than it would be with a stock-style control arm and the same spring. The shocks may top out, having reached full extension, before this height can be reached. Down In place In place +0.5"
Down Removed In place +0.4"
Up In place In place +3.5"
Does not have any provision for attaching a stock-location swaybar. Use the MM rear anti-roll bar. Fine tuning of spring rates in 25 lb/in increments is possible by using this control arm along with standard coil-over springs and the MM 2.5" rear spring adapter. Improves traction by eliminating unwanted sources of deflection. Eliminates deflection allowed by rubber or urethane bushings. Eliminates deflection allowed by the stock stamped-steel control arm. Does not cause the suspension binding typical with common urethane bushings and solid bushings. Wheel hop is eliminated or greatly reduced once deflection is eliminated; the quad shocks are often unnecessary. Improves rear suspension stability and consistency. Easy adjustment; no need to jack your Mustang up off the ground. Fits both stock-style springs and 2.5" coil-over style springs. Large spherical bearing at both ends of each control arm completely eliminates unwanted deflection, while allowing proper articulation of the suspension. Plated steel reducer inserts in the spherical bearings, sized to fit the stock hardware. Strong and stiff round steel tube construction. Grease fitting to easily lubricate jack-bolt threads. Designed and manufactured by MM in the USA. You can read Maximum Motorsports' detailed MMRLCA-34.1 Rear Lower Control Arm installation instructions before purchase.